Learn traditional West African rhythms on the djembe drum in a group setting that is welcoming of newcomers and lots of fun! 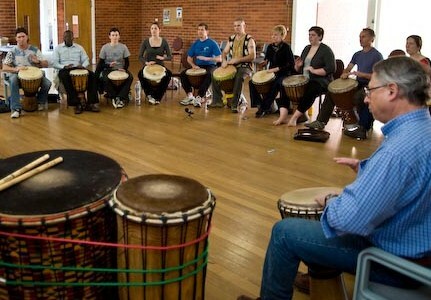 Experienced teacher, Kate Gascoyne, will develop your musicianship, teach you the basic techniques of playing djembe, and have you grooving along with the group sooner than you would think possible! This highly popular course runs four times per year (covering different rhythms each term) allowing participants to continue in the Beginner Course for a number of terms before moving to the Experienced Course. Bring your own djembe or hire a djembe (for an additional $30) to be brought to each class for you.